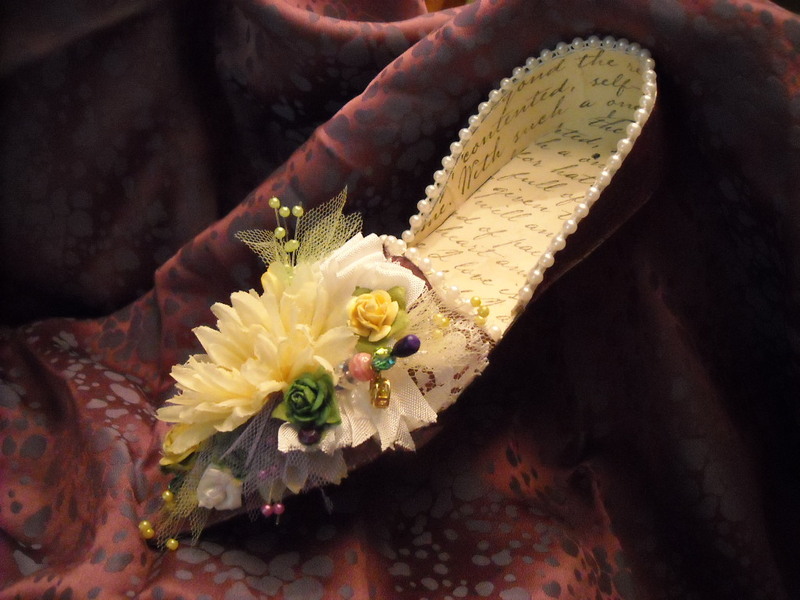 This is one of my Mini Victorian Shoe Albums which is to be given as a wedding gift and is done in the wedding colors the bride had chosen. In this case, yellow and deep purple. The touches of dark Notre Dame green are to honor the groom and the white and pearls to reflect the bride’s gown. If you click on the picture you will see it in greater detail. The little hole in the heel is where the ribbon will be run through to attach three more pages with five photo mats and a journaling spot. Two ovals of fine paper with a photo mat on each side tuck inside the toe of the shoe with just the decorated edge of the ovals peeking from under the top edge of the shoe. To see a photo of another of these albums, opened, check my post of June 16, 2011. That shoe was in my Etsy Shop (www.miniwonderfulthings.etsy.com) and has been sold. The buyer was a fellow papercrafter and needed the gift right away but also wanted to try her hand at making one. It hadn’t occured to me until then to make a kit but I did it for her and now have the ability to offer the kit in my shop as well. Making the first set of instructions was the toughest part. I had originally gotten the pattern for the shoe from another source but had to muddle through much trial and error to make a sturdy mini album rather than just a paper shoe. I have purchased a number of kits over the years and know how necessary good, step-by-step instructions and illustrations are. I like to think I accomplished that with this kit and hope it will be well received. 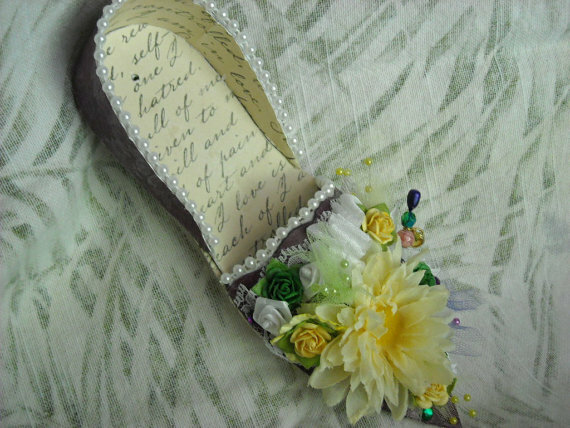 This entry was posted in art, papercraft and tagged Album, beads, bridal, feminine, flower, journal, pearls, shoe, wedding. Bookmark the permalink. Lucky bride and groom. I love the added color. Oh Myyyy . . . Really did turn out beautiful Sis.